Today was not the best photo day for me. I relied on my iphone a bit too much, but I did snag this shot of our Friday afternoon snacks at the office while my boss was away from the table. When we got home we had a package waiting on our doorstep. If any of you have younger siblings you will be familiar with this scenario. A month or so ago we got an email from Brian's mom explaining that Bri's little bro was having a fundraiser at school. We had a catalog of things to choose from, and wound up ordering some wrapping paper and these little beauties. 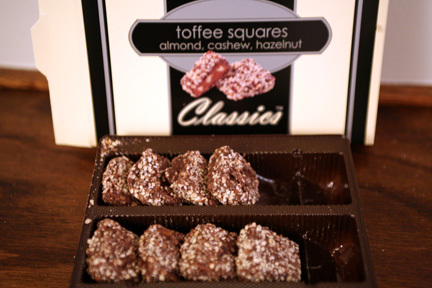 Considering that we paid $15 for 10 little 1" x 1" toffee squares I couldn't resist eating one of them, but I'm happy to let Brian finish off the box cause they are calorie heavy. And now for the real photo tragedy. I was so rushed taking my dinner pictures that I didn't realize that my memory card was not in my camera. :( So sad. I'll tell you about dinner, but you'll have to picture its loveliness in your head. Dinner: Chicken tenders a la coffee talk with sauteed garlicky collard greens and roasted parmesan cauliflower. The tenders were good, I did half the batch with honey mustard dressing and the other half with bbq sauce. I baked the tenders for about 20 minutes, smeared them with sauce, then broiled them for about 3 minutes on each side. Watch closely though, every oven's different and they could burn quickly! The collards were great as always...love me some greens. And the cauliflower was okay. 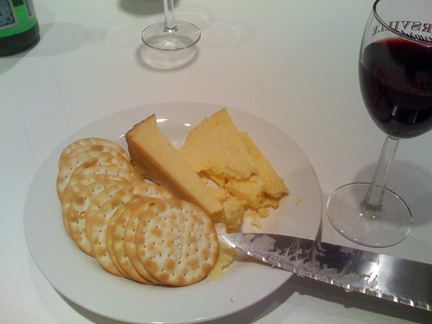 Brian really liked it, but I thought maybe I put a bit too much parmesan on it, it was a little rich for me. I only ate about a 1/2 cup. 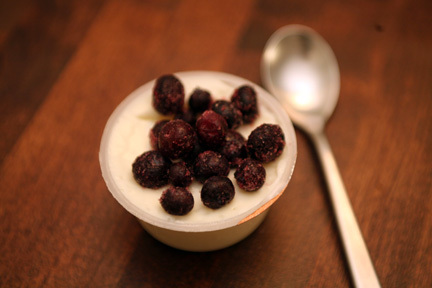 I realized my camera mistake by the time I fished some dessert out of the fridge: Kozy Shack rice pudding with frozen blueberries again. This was the one photo I could have done without since it looks exactly like last night's dessert!